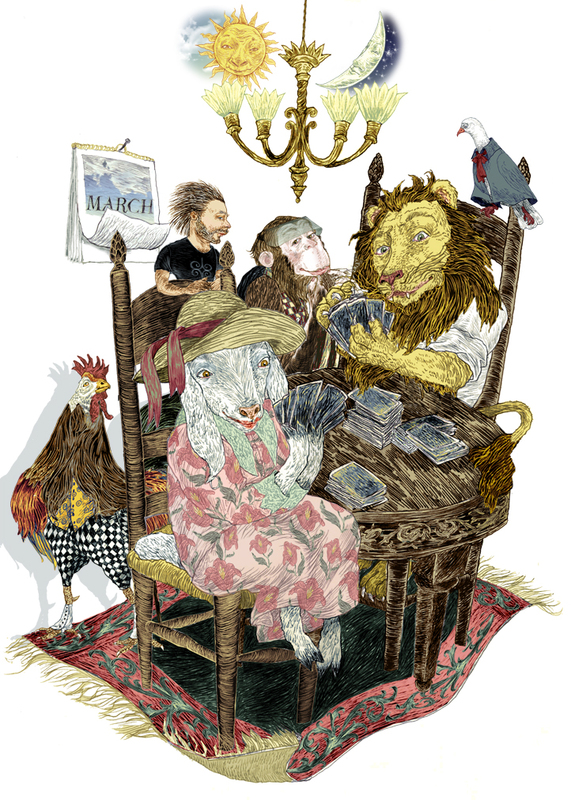 Beneath the iridescent glow of a crystal chandelier, March’s fate lay in the cards. Would the month begin with the icy breath of a roaring storm or with the gentle bleat of a spring breeze? Excitement ran high among those with stakes in this annual game, for the cards were to be held by those famous adversaries, the Lion and the Lamb. The game required a curious playing deck consisting of three hundred and sixty-five cards (with a wild card thrown in for leap years). Its four suits distinguished the deck, each representing one of the four elements: earth, air, fire and water. On the cards within each suit, specific weather conditions such as thunderstorms or clear, blue skies were depicted. But these magical cards were more than just pretty pictures. As they were selected in the game, each image exuded its unique sounds, sensations and smells! A dealer was appointed to divide this enormous deck into twelve stacks of cards, corresponding to the months of the year. From those stacks, he then dealt each player twelve cards. The remaining cards were tossed into a barrel and shuffled so they could be reassembled into one large stack at the center of the ornately carved table. The rules of the game decreed that neither the Lion nor the Lamb were to see each other’s hand, but were to select cards in turn from the center stack, rejecting unwanted cards back into the barrel for next year’s game. Then, by means of dealing, trading and bluffing (if necessary), each player must build a complete hand of thirty-one cards (corresponding to March’s thirty-one days) whose suits and weather conditions matched their own meteorological vision. The large hall of the Inn was crowded with spectators and speculators proclaiming their wagers and noisily debating the fate of March. Among these were the weather vanes’ Rooster, the Groundhog, the Dove and the Monkey. By virtue of their special interests in the resolution of the match, the four were permitted to surround the principal players. The Rooster, having abandoned his weathervane for this event, anxiously hoped for an early spring in March. He was a proud fellow, but he was exhausted after a long winter of announcing early sunrises and taming temperamental winds. An early spring would allow him to do his tasks a wee bit later in the morning. And so he crowed enthusiastically for the Lamb. The Dove cooed for the Lamb, too. As the messenger whose task was to let other birds know when the ice and snow would end, Dove’s sentiments were also personal; she dearly missed all of her friends who flew south for the winter. The Groundhog, charged with predicting the fate of winter for humans, had grumpily crept out of his burrow for this game, grunting in favor of the Lion. He wished to enjoy his winter nap for just a little longer. And the Monkey, gifted with a special knowledge of the language of plants and trees, was entrusted with bearing the tidings of spring to jungles and forests everywhere. In recognition of her intelligence, she was appointed to act as dealer. This obliged her to remain neutral, though she secretly hoped for an early spring. There was nothing she liked better than swinging lazily on a thick vine and munching an early crop of mangoes. When the table was prepared and everyone had settled down, the Lion and the Lamb entered the room, greeted their audience, and took their seats. While the Monkey dealt their cards, the players exchanged menacing glances and crooked smiles, each determined to emerge victorious from the match. As the game proceeded, the Lion could barely suppress his little rumbles of delight; for the majority of his cards depicted his signature storm symbols: lightning, thunder, snowy blizzards and hurricanes. Smugly, he glanced around the room and then at his opponent; a clear gesture that he held the winning cards. On the other hand, the Lamb, with her gentle features drooping, seemed to be down on her luck this year. Shivering from her handful of wet, cold, windy storm cards, she desperately wanted to declare an early spring, and hoped that some of her beautiful sunshine and flower symbols would turn up soon. Suddenly, as if the powers that be had heard her wish, the stack of cards at the center of the table began to yield one springtime card after another! Growing more excited with each turn, the Lamb could nearly taste her victory as her fans cheered her on. The Lion began to growl in frustration, his whiskers wrinkling at the scent of the spring grass and crocus cards, which kept cropping up. Peeved by the waning encouragement of his supporters, the big cat was not a good loser. But he did have a flair for drama. Narrowing his big green eyes, he stood up as if about to stretch, letting loose a sound that was somewhere between a laugh and a roaring yawn. The startled Lamb gasped and dropped her cards, then bleated accusingly at her opponent for cheating. The Monkey, who had just reached out to straighten the center stack of cards, trembled, scattering the remainder of them all over the table and floor! To make matters worse, the crowd had begun to panic. What would become of the month of March? After a few moments, the Lamb’s natural grace and charm returned, and she giggled as she regarded the mess on the table and floor. “Oh, well,” she shrugged philosophically, ” I was getting tired of this old game anyway!” The Lion, somewhat abashed by the Lamb’s swift recovery, felt a slow smile creeping across his chops. “So am I,” he agreed, nodding his shaggy head. “Besides,” he added slyly, ” I’ve heard there is a cheap flight to Paradise this weekend. Would you like to join me?” Fluffing the curly wool behind her delicate pink ear, the Lamb glanced flirtatiously at the Lion, and happily accepted his offer. The crowd of spectators and speculators had finally regained their wits and were so busy arranging their wagers for next year’s game, that they never noticed the Lion and the Lamb waltzing out of the Inn’s doors locked in an embrace. The powers that be rolled their collective eyes indulgently as they helped a very sleepy Rooster back to his weathervane perch atop The Inn Of The Four Winds. This year, for a change, March would have to take care of itself.